Traveling with a disability can be difficult at times, but traveling with a motorized wheelchair presents special challenges. I learned more about those challenges when I accompanied my good friend Karen on a trip last summer. Karen lives with primary progressive multiple sclerosis (PPMS) and uses a motorized wheelchair to get around. She was headed to an MS event in Chicago to discuss an upcoming MS medication, and I accompanied her to provide assistance in the airports and to ensure safety in the hotel. This was my first time traveling with such complex equipment and the experience was truly eye-opening as there was nothing simple about the process. I’ve asked Karen to share what she has learned about flying with a motorized wheelchair as she travels the country as a patient advocate. Lisa: Karen, how long have you lived with MS and what kind of wheelchair do you use? Karen: I was diagnosed with MS in February 1996, but distinctly remember symptoms in August 1994. My wheelchair is a Permobil M300 with the capability to recline, tilt, and raise up. It weighs 345 pounds, has headlights and taillights, and can go about 6 miles per hour. I use the chair because of bilateral weakness of my lower extremities and extremely poor balance, which combined seriously limit my ability to walk. The wheelchair gives me freedom and allows me to maintain my independence. Lisa: When you travel by air with such a specialized chair, are there things you need to do as a passenger when you book your ticket? Karen: When I book a ticket, I have to be cognizant of the type of plane used for the flight. The cargo holds of commuter or regional planes are not large enough to hold my chair, while the weight of my chair presents limitations. Also, planes used for shorter flights that are accessed from the tarmac, rather than the jetway, and require walking up steps to get into the plane are no longer an option. After receiving my ticket for a recent trip from [a] travel agent, I realized that the cargo hold was not going to be large enough. It took multiple phone calls to successfully explain the problem to somebody at the airline. When I found a flight at a nearby airport that could accommodate my chair, the airline wanted to charge me a change fee, so I had to call the travel company. Lisa: The meeting planners knew that you were traveling with a power chair. Why do you think they didn’t research the flight and plane like you did? Karen: Basically because they were not familiar with the needs of somebody in a complex wheelchair. We often tease that my wheelchair is not your grandparents’ wheelchair. It's not manual and it doesn't fold up. Lisa: How early do you arrive at the airport to make sure that everything goes smoothly? Karen: I prefer to arrive at the airport at least two hours prior to my flight, sometimes three hours. I do this because I never know how long it's going to take to get through security. More importantly, I always ask to speak to the ramp manager who is the one that will be responsible for my chair once I transfer to an aisle chair to get on the plane. When I meet with the ramp manager, I demonstrate how to make my chair easier to transport and load into the cargo hold. Lisa: Last summer when we went through security at the airports, we had to wait for an extended period of time and it seems like there were extra people involved. What has been your experience going through security checkpoints? 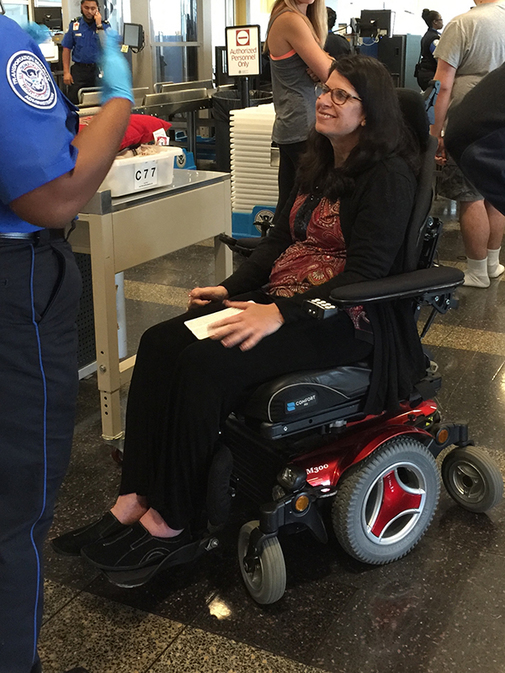 Karen: Security checkpoints usually take longer for me to get through, but not directly because of the chair. I'm usually used as a training tool for new TSA agents. First, they have to use a female agent to do the security check. If you look around you’re not going to see as many women as you do men working the checkpoints. Second, they do not get many passengers that come through with a chair like mine. They often want to instruct new agents and I'm a good guinea pig. Another reason I build in extra time. Lisa: Sounds like they should be paying you for the training you provide. Karen: I wouldn't mind teaching the TSA folks and even the folks that are at the gate. I’d do it for free just to do my part in raising awareness about folks with physical challenges. The chair is just a tool. Lisa: What is your greatest fear when traveling with your chair? Karen: My greatest fear is having something break down on my chair before or during the flight. Being prepared and having a caregiver that travels with me has made all the difference in the world. When we were having difficulties with the arm of my chair during our trip, it was great to have someone else there to help solve the problem. Your help definitely put me at ease. But if something does break down to the point where the chair is not functional, there’s a company we can call 24 hours a day for assistance. I keep that number handy. Lisa: What considerations need to be made in advance to make sure that you can get to your final destination safely after you’ve landed? Karen: Once I arrive at the destination airport, I need to find an accessible transport vehicle. I have three choices: 1) I can pre-arrange to rent an accessible van; 2) if I am staying at a hotel, I check to see if they have an accessible shuttle van; 3) and finally, my last option is to go to the taxi stand and ask them to call me an accessible taxi. Lisa: What else would you like to share about traveling with your wheelchair? Karen: My most important advice is to plan, plan, plan, and prepare, prepare, prepare! How NOT to Park in the Handicapped SpaceWhy Should You Get a Disabled Parking Placard?What is Vestibular Rehabilitation Therapy?